In Space Warriors six highly skilled teenagers are handpicked to be part of a summer space camp competition at the U.S. Space & Rocket Center in Huntsville, Alabama. As the competition heats up, the kids have no idea that their ultimate challenge will be to solve a life or death crisis aboard the International Space Station as the world anxiously watches. 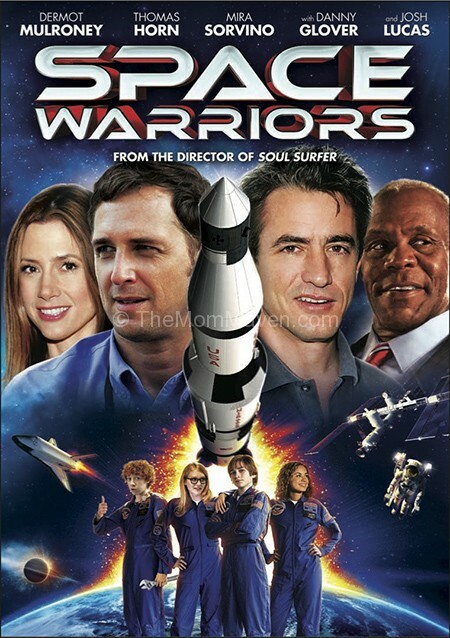 Space Warriors stars: Thomas Horn, Danny Glover, Josh Lucas, Dermot Mulroney, Mira Sorvino and Booboo Stewart. The winner will win a copy of the Space Warriors (Blu-ray + DVD + VUDU Digital Copy). US entries only, NO PO BOXES. The giveaway ends at 12:00am on 6-14-13. The winner will be chosen by Rafflecopter and have 48 hours to claim their prize via email. I LIKE THE DRESS LIKE AN ASTRONAUT. Apparently I am a Astoundingly Awesome Astronaut! I think the Dress Like An Astronaut activity is fun. I am an Astoundingly Awesome Astronaut. 🙂 Thank you. I’m an astoundingly awesome astronaut. Who knew? The dress up like an astronaut activity is my favorite.